The builders are making good progress and should hand over the building to the Library Service in May. 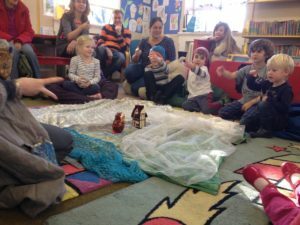 They will then fit out the library and community rooms, and target re-opening in June. We are planning to hold an Opening Week of events at the library as part of the Chesterton Festival week 21 – 29 June and want your ideas. How can we attract new users and members of the community? How do you want to use the library and community rooms? Are you available to help during the opening week? 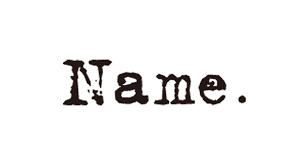 The library services are thinking about possible names for the new community room spaces at the library, so will be coming up with some suggestions soon. Can you think of anyone you’d like to see celebrated by having one of these new rooms named after them? If you have any ideas you’d like to share, please feel free to pop into the mobile library at Roger Ascham to write your thoughts down on a post-it note. We have commissioned artist Nicholas Juett to create some bespoke artwork for the new Milton Road Library. 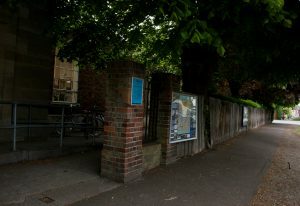 Nicholas grew up nearby, attending Milton Road Primary School, and the library was an important space for him as a boy. He spent time sketching the old building before it was taken down and part of the new main painting will include book spines. Nicholas would like to include some of the titles of the all-time favourite books of the people who will be using the library – so we want to know what yours is. Please come to the mobile library at Roger Ascham to write your favourite book title down on a post-it note – who knows, maybe your favourite book will make it into the artwork! 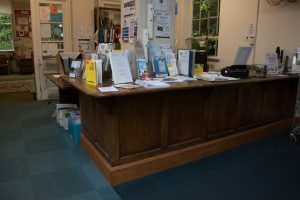 The Friends of Milton Road Library have been actively supporting our local library since 2011 when we successfully worked with other Friends groups across the county to keep our local libraries open when threatened with closure by the county council. 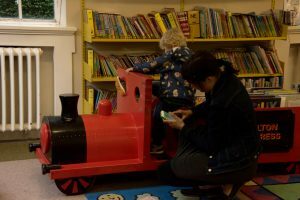 Having won that battle it was discovered that there were structural problems with our Milton Road library and it was once again under threat of closure. As a Friends group we supported the County in developing plans for a more viable future and also worked to secure £100,000 from the City Council for providing community facilities in the new building. A venue for local clubs and interest groups in the day and evenings, such as poetry sessions, book club, film club, and adult education classes for older people. 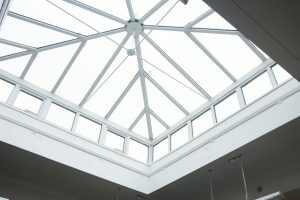 the ground floor area will be fully accessible and as flexible as possible. Book shelving will be easily movable so that the main library can itself be adapted at times for different purposes. Two community rooms will be provided and have moveable partitions so that they can form a bigger area or opened up with the library so that whole ground floor can be used for large events. Toilets and a kitchen will be accessible for all users of the building. The original portico has been retained and will be rebuilt to form the main entrance to the new building. The library will have an area for children but also a separate area for teenagers with some of the computers located there and available for after-school study. The community rooms will have video screens and easily storable furniture so the rooms can be used a for a wide variety of purposes. The outside spaces will also be as welcoming, accessible and flexible as possible, offering a valuable and important community green space with mature trees in this area. The fencing will be lower and more welcoming than previously and we hope to use the garden for more events especially in summer months. During the project we were able to crowd fund for the wonderful set of hoardings around the site. The artwork for this came from the children at Milton Road School and was skilfully brought together by graphic artist Patsy Rathbone. When no longer needed around the site the hoardings boards will be given to the school but it is also planned to use elements of the artwork within the new library. 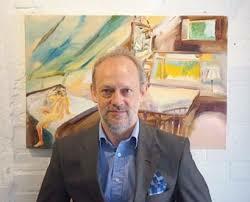 The Friends have also commissioned the artist Nicholas Juett, who lives locally, to provide two new paintings for the new building to recall memories of the old buildings. Plans are now being made to celebrate the opening and ensure the widest possible use for the new spaces as possible by our community. Many thanks to Jannett Klinke for sharing these photos from the old building. So looking forward to seeing the spaces we will be opening up soon in our exciting new building. Hard at work installing the new and colourful hoardings outside of the library site to brighten the corner! Thank you for everyone who contributed in one way of another. 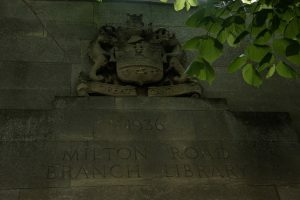 View more pictures on the Friends of Milton Road Library Facebook page. So thrilled to see the display panels beginning to come off the press at Anglia Graphics! We can’t wait for them to be put up at the end of next week. The artwork looks fantastic, artist Jo Tunmer has done a great job in combining the drawings into a magical landscape. So so excited to see this taking shape. Great news for a Friday afternoon! Huge thanks to the brilliant Anglia Graphics in Swavesey who’ve agreed to support our The Art of Reading project by printing the hoardings at a significantly reduced price. The project will now cost a total of £2,750 and having raised a magnificent £1,250 from 62 donors, as well as funds from the City Council and other sponsors, we’re just a few hundred pounds short of our target! Here’s a glimpse of what’s to come – one of the stretches of artwork created from some of the children’s drawings by the fantastic Patsy Rathbone! Do help us reach the target by heading to our Crowdfunding page if you haven’t already given!